Picture shared on the Facebook page of Pondera Properties, a group of realtors and Possum Kingdom Lake area residents that has become a support group for fire updates. Residents of a North Texas lake subdivision threatened by a wildfire have been allowed to return to their homes. The Texas A&M Forest Service said the residents of the Peninsula neighborhood at Possum Kingdom Lake were allowed back into their homes Tuesday night. Forest Service spokesman Nick Harrison says the wildfire charred 44 acres, not the 130 acres originally estimated. He says the blaze is 70 percent contained, and that crews "are in the mop-up stage." He also said rain expected Wednesday was expected to help teams conquer the fire. 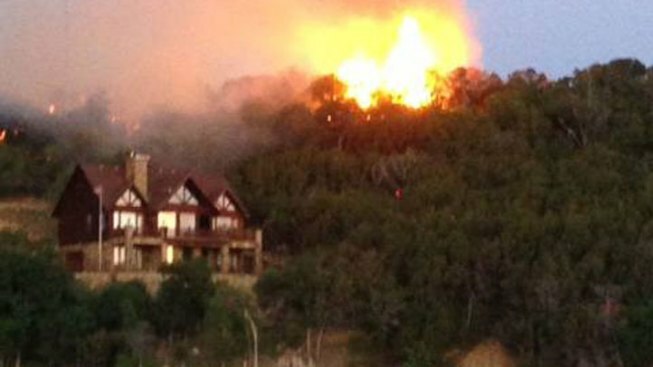 About 30 residences were evacuated after the wildfire began Monday. No injuries have been reported and no structures damaged. The area about 75 miles west of Fort Worth was the scene of fires in 2011 that destroyed dozens of homes.